Trails are wonderful. They are sure paths to adventure. I am infinitely grateful to the generous souls who spend their weekends building and tending trails so that people like me may discover and enjoy new vistas, but lately I’ve come to have an even greater appreciation for old mountain/canyon roads that have been washed out of history due to flash flood and erosion leaving little more than a footpath. They make interesting trails full of questions about the people who once used them to tend their land or mines… And more than that, I’ve developed a love/hate relationship with animal trails. While the Southern California weather was still hospitable to human life, I made the time to explore Devil’s Punchbowl in the Mojave Desert that nudges up against the infamous San Andreas Fault. The punchbowl is a basin of rock fins pushed up to nearly vertical points by earthquake action of San Andreas and Pinyon faults.of California earthquake fame). Imagine enormous pieces of sandstone earth in the shape of cow patties that were squeezed up onto their sides next to each other like slanted Oreos in their package after you take a couple out. That’s what the punchbowl looks like. A canyon full of sandstone fins. 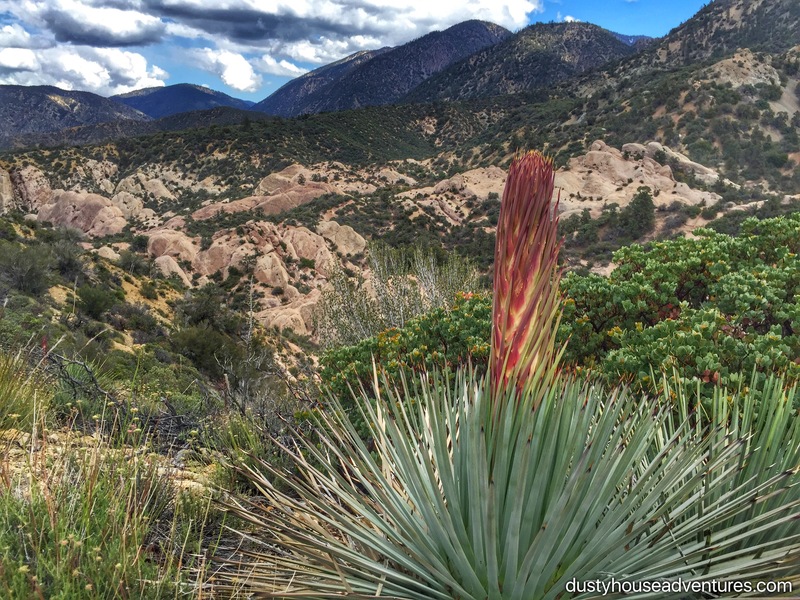 I intended to tamely hike the 1 mile loop trail around the punchbowl and then do the 8 mile round trip on the Pacific Crest Trail along the mountain ridge behind the punchbowl to see the formation the next canyon over which is called the Devil’s Chair (its similar to the punchbowl). But I quickly found myself falling prey to the “what’s over there?!? 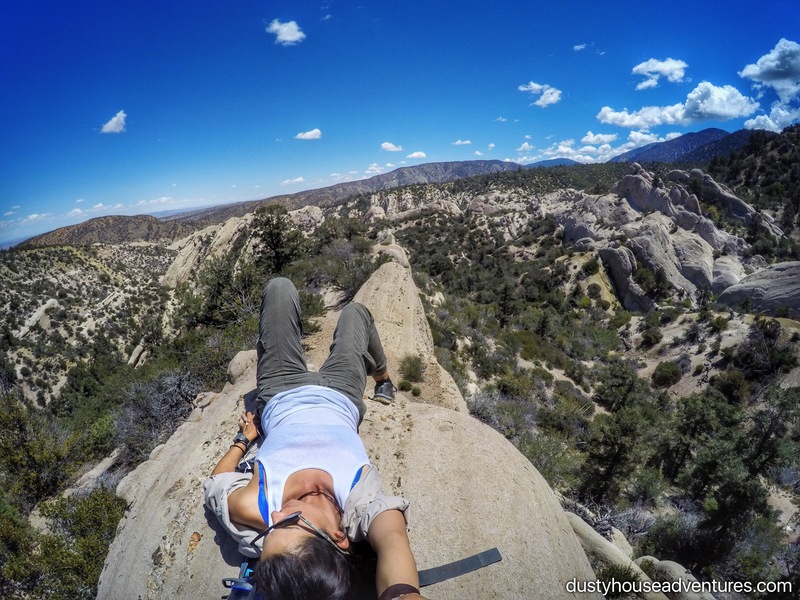 !” explorer syndrome and off trail. I ended up on the floor of the Punchbowl surprised to find a creek, erosion in action! You can’t see the creek from the top and it was a pleasant surprise. 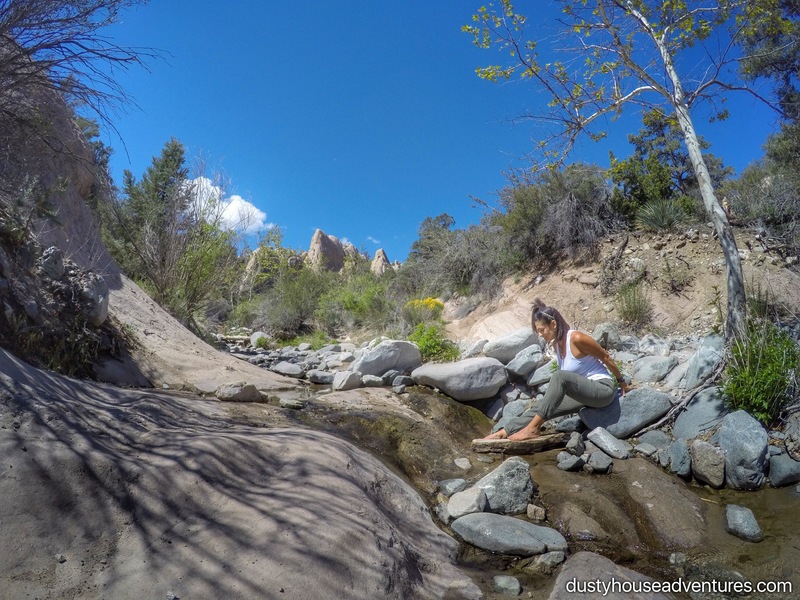 I made my way down to the stream and soaked my feet in the cool water, which felt soooo good after trudging through tons of loose sand the day before where I hiked and camped at Saddleback Butte. Then, instead of going back to the trail I just decided to follow the stream and see where it comes from. What fun! 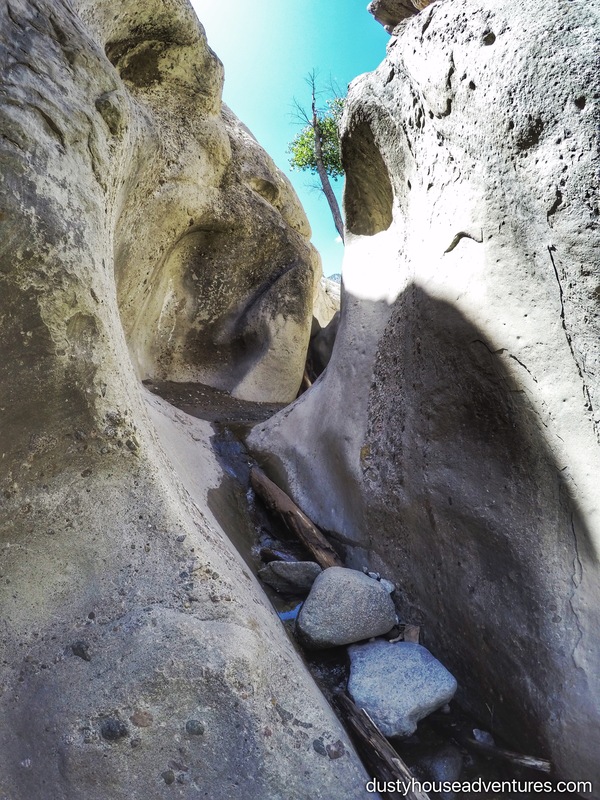 The stream lead me to a mini slot canyon that I had to boulder up, sometimes using logs as ladders. I got pretty wet, but whatever. When I got tired of following the stream I decided to try to get back up to the ridge where the trail was so I started hiking straight up the steep canyon wall to get to higher ground and find my bearings. Where it brought me out was right in the middle of the punchbowl on top of one of the fins! It was incredible. I sat down on this narrow fin in the sky and just basked in the majesty of being so lucky to find myself in the middle, so high up, surrounded by such a surreal landscape. Birds were flying lower than me. I stayed there for a long time and ate lunch and read one of my favorite inspirational books, meditated, and took a little nap. It was magical, truly. Transcendent. When I decided it was time to go I found another steep trail-less incline and huffed and puffed my way up that hoping it would connect to the mountain and thus the trail. I kept thinking of the day I was lost in Sycamore Canyon, AZ and was constantly climbing up steep, sandy, trail-less hillsides hoping what I was looking for would be up there. I concluded it was my lot in life to constantly be trudging up steep hills hoping I’m going the right way. 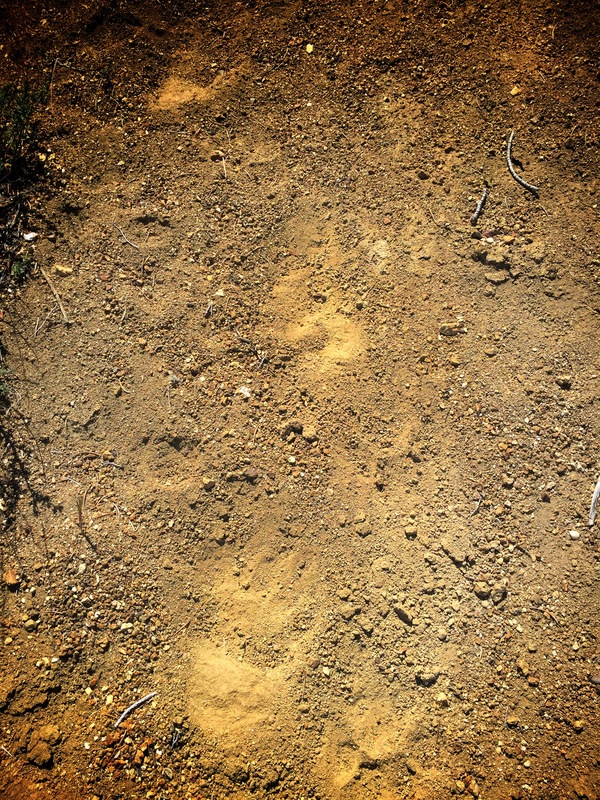 I kept seeing imprints in the dirt like someone had been there before so it gave me hope. I thought, “oh goody, I’m on the right path” if I keep following this ‘trail’ I’ll get there. Will I ever learn? Animals make prints too. 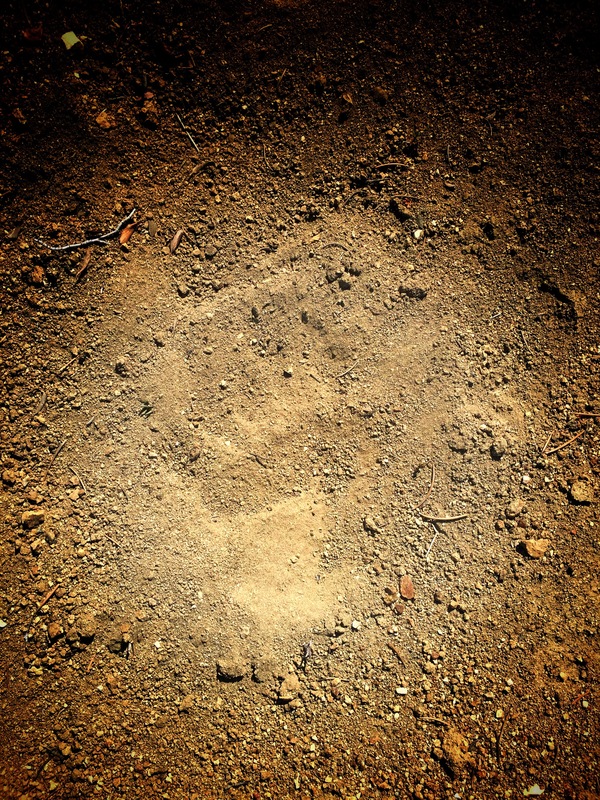 I got to a place where the dirt was especially soft and malleable and what I saw were perfect bear footprints. I’d been following a bear’s trail! Until this point I’d been distracting myself from being tired by listing to music, but once I realized I was on a pretty fresh bear trail I turned the music off FAST and looked all around to see if I was wandering into a bear den or if maybe one or more might be hanging around trying to get at the scent of chicken salad I had for lunch! Fortunately I was not eaten by a bear and the bear lead me to where I wanted to go, the Pacific Crest Trail, where he probably harasses smelly thru-hikers for a living. I hiked over to Devil’s chair, but once I saw it, I was pretty “meh” about it having just had a spectacular time at the other canyon. I decided not to go down in, but rather turn around and take the nice easy PCT back to the start. I was rolling along, listening to music and smiling, thinking of good friends and good music. I had a sudden powerful burst of happy emotion and closed my eye for a moment to settle down. 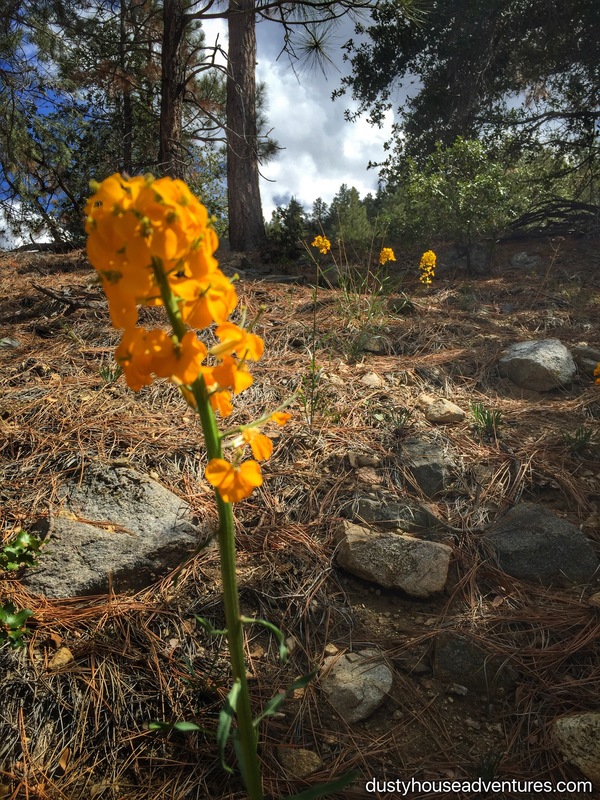 When I opened my eyes there was this gorgeous, ripe yellow flower growing by the side of the trail. 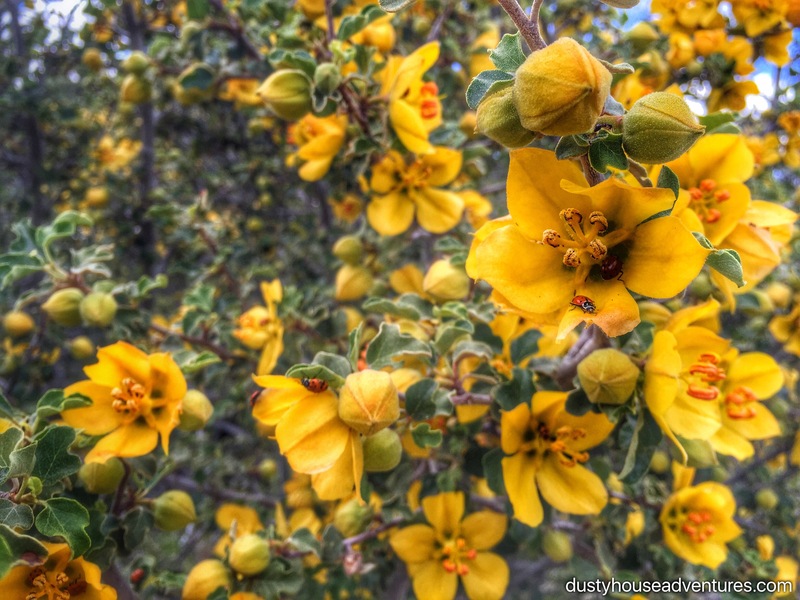 It was so vibrant that I felt compelled to smell it, which isn’t something I normally do, I’m not typically a big flower enthusiast, I mean, they’re alright… But I really wanted to smell this flower and it was SO sweet it had flavor. To smell it tasted like drinking honey. The sensory experience of beauty and gratitude was so intense that it made me notice all the other wildflowers which were in full color. 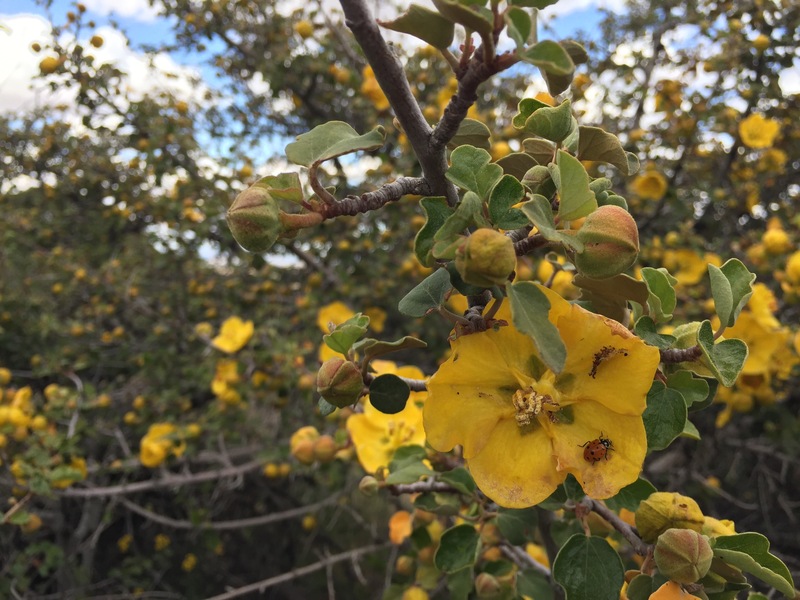 There were these trees that had waxy yellow flowers all over them and when I looked closely I saw that every flower had one or two ladybugs inside. Everything about the day was beautiful, just layer upon layer of beauty that I kept discovering the closer and deeper I looked. 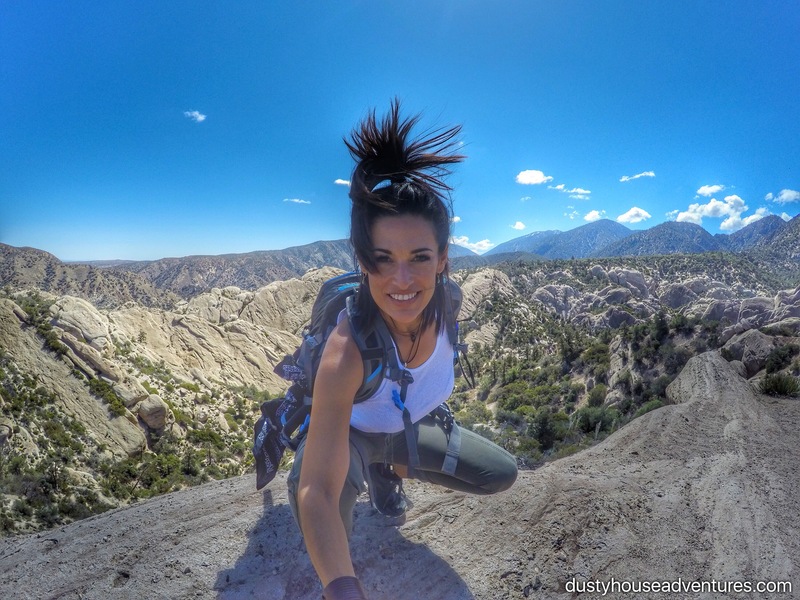 The Devil’s Punchbowl, in the desert gateway region of Los Angeles County, held me so sweetly. It is an intimidating landscape full of seemingly impassable spikes and heat, but once I cuddled up to its underbelly with innocence and wonder, I found it to be rich with water and life, expansiveness and intimacy, inviting the traveler to meet it with humility and receive its tender, unexpected gifts.